The watermelons grown in Oton are the best in Iloilo and thus making a name for itself as Iloilo’s “Watermelon Capital.” And to promote the sales of watermelon from the surrounding orchards. The municipal government of Oton in partnership with East West Seed Company brings watermelon farmers on a common platform towards the promotion of its agrobased tourism through the annual celebration of Sandiya Festival. The celebration is a step forward in helping farmers become economically stable benefiting from watermelon cultivation. The people of Oton join hands to bring the freshest sandiya or watermelon to Iloilo in a myriad of shapes and colors all at one place. 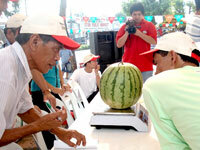 The watermelons will be the subject of different types of competitions: eating, carving and weighing-in. It is open to all, no limits, with a ready supply of freshly-picked watermelons from the nearby orchards. The annual municipal fruit fair present an ideal opportunity to savor the very best watermelon. In addition to fruit contests, displays of agricultural and horticultural produce and sales of local handicrafts and products from different barangays will add to the festive ambience of the event. December is the peak season and during this time of the year, thirst-quenching, full-flavored, nutritious watermelons abound in the area. Ready for harvest, watermelon orchards in many remote barangays of the town are open to visitors, presenting wonderful opportunities for private tours and Agri-tourism. Some offer ‘all-you can eat and pick’ at irresistible prices. Festival is filled with activity of all sorts for both kids and adults. Enjoy eating Watermelon all day long! As they say, in Oton, one will find fun, fresh tastes and lots of watermelon smiles.